At just 0.5 mm wide on average, the eye area is one of the first to show signs of stress, aging or compromised health. Heredity, squinting, sun exposure and free radical damage further complicate matters by depleting natural lipids and reducing moisture levels. The results? Puffiness, dark circles, fine lines, wrinkles and sagging. With proper skin care and the following tips from Dermalogica skin experts, you can help combat these effects. Because of the delicate structure of the skin around the eyes, it's important to use a gentle touch. Also, for maximum results, apply your eye treatment on clean skin before you apply moisturizer. The latter can act as a barrier to your eye treatment. Tap, gently massage and let it sink in for several minutes for best absorption and to help prevent your make-up from caking or sliding. Tip: Use your ring finger for the gentlest touch. Pull at your skin, stretch it or rub too aggressively as you apply your treatment. 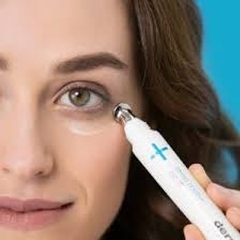 This can accelerate wrinkles and further irritate the eye area. Should you apply eye treatments day or night? It depends on the formula. While eye creams can help plump lines and soften wrinkles, those with more emollient ingredients can cause eye make-up to run. If shifting eye make-up is a concern, apply richer eye treatments at night and use light formulas and/or eye make-up primers in the daytime. Always wait for your eye treatment to dry before applying make-up. How do you know which eye treatment to buy? Many eye treatments are formulated to treat multiple skin concerns, but it's important to choose a product based on your top concern, as well as personal preferences such as how often you will apply the formula. Brightens, de-puffs and hydrates to reduce visible signs of stress. Hydrates to reduce visible fine lines while defending skin with antioxidants. Works overnight to combat the appearance of aging with Retinol. Firms loose skin, smoothes fine lines and defends against visible signs of aging. Soothes irritation while helping to minimize the appearance of puffiness. Tinted daytime formula provides UV protections and helps conceal dark circles.